Clooney looks “ace” in the Daily Mirror. 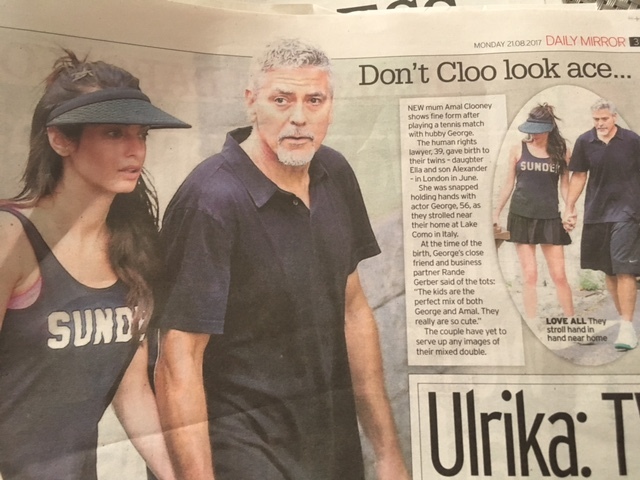 The paper has a paparazzi shot of George Clooney and Amal Clooney at a tennis match lose to their home in Italy. Neither is holding a racket, but they are holding hands. They look like a well-groomed couple minding their own business. But over in the Mail, Clooney is “frazzled”. He’s a new dad “after two months of sleepless nights”. No, not or the couple’s umpteen nannies, for George. To prove its point (surely to spin a story from a papped photo? 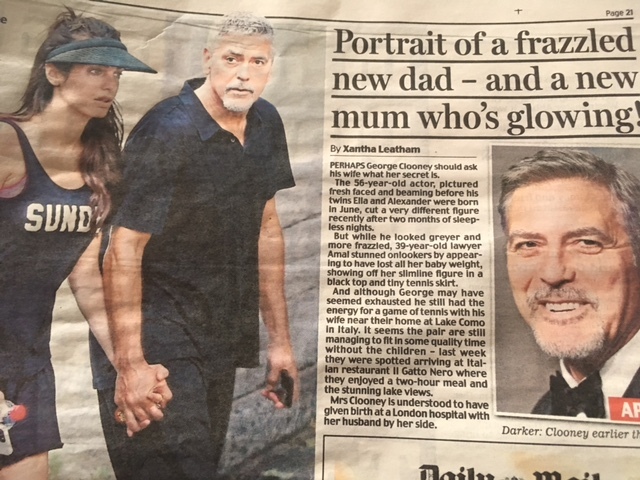 – Ed) the Mail shows us Clooney looking “fresh-face and beaming” in April. “Mail leads the way in banning paparazzi pictures. “Viscount Rothermere, chairman of the Daily Mail and General Trust plc said: ‘I am, and always have been, an admirer of Diana, Princess of Wales, and nagged my editors to protect her so far as they could against her powerful enemies.